We have so many deer come through our yard, and get excited every time we see them. They just wander through the yard and leave as quick as they arrive. Our decorating style is woodsy, and while I haven’t always wanted a deer head for the wall, I really love the look of faux animal head mounts. These are very animal friendly and is such a popular trend! We’ve seen animal heads made from ceramic, metal, wood and fabric. These heads can be found in all shapes and sizes from Elephant heads to Unicorns! We set out to create a faux deer head using our wood paper. We found this cool cardboard deer head, Bucky, over at Cardboard Safari. 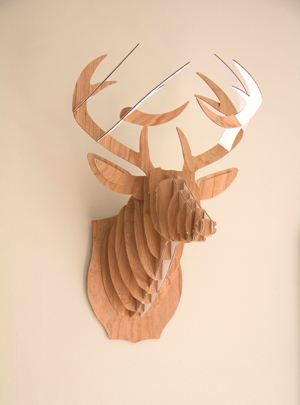 While the deer head looks pretty awesome in cardboard he looks amazing covered in our adhesive backed Cherry Wood paper. What do you think? If this project inspired you check out many of these inspirational sites for more faux animal heads. This entry was posted in Crafts & Kits, DIY Projects, Home Decor and tagged 3D, cardboard safari, cherry.